This paper introduces a theory-based approach to design for mood regulation. The main proposition is that design can best influence mood by enabling and stimulating people to engage in a broad range of mood-regulating activities. The first part of the manuscript reviews state-of-the art mood-focused design research initiatives, grouped into four basic intentions, exploring how technology can measure, express, adapt to, or influence mood. The second part provides a functional explanation of the mood phenomenon, addressing how mood can be described, the function of mood, manifestations of mood, and how mood differs from emotion. The third and final part of the manuscript introduces an overview of novel mood-regulation strategies, and explores how these strategies can inspire design interventions. Twenty activity-based opportunities to design for mood regulation are grouped into three main focal categories: seeking relief, restoring balance, and building resilience. Keywords – Design for Mood, Design for Well-Being, Mood Regulation. Relevance to design practice – This paper provides a new perspective on the impact of design on mood. It includes an overview of current mood-focused design research, a basic theory of mood and mood regulation, and a novel approach to design for mood regulation. Citation: Desmet, P. M. A. (2015). Design for mood: Twenty activity-based opportunities to design for mood regulation. International Journal of Design, 9(2), 1-19. Received February 25, 2015; Accepted July 9, 2015; Published August 31, 2015. Copyright: © 2015 Desmet. Copyright for this article is retained by the author, with first publication rights granted to the International Journal of Design. All journal content, except where otherwise noted, is licensed under a Creative Commons Attribution-NonCommercial-NoDerivs 2.5 License. By virtue of their appearance in this open-access journal, articles are free to use, with proper attribution, in educational and other non-commercial settings. Prof. Dr. Pieter Desmet is chair of the Design for Experience research group and program director of the Design for Interaction master’s program at the Faculty of Industrial Design Engineering at Delft University of Technology. His main research interests are in the fields of design, emotion, and subjective well-being. Desmet is a board member of the international Design & Emotion Society and co-founder of the Delft Institute of Positive Design. Some days we are cheerful; others, we are grumpy. Likewise, we can be calm, nervous, relaxed, excited, glum, or perhaps irritable: Although our awareness of such affective dispositions may not be continuous, we are always in some kind of “mood”. Moods pass —they can last for hours, or sometimes even days, but they are constantly changing and converging into other moods. At the same time, moods are pervasive. They represent the nonreflective feeling state that forms the core of our affective being (Russell, 2003), and they are a direct indicator of our general subjective well-being (Diener, Fujita & Sandvik, 1994). When in a good mood, people evaluate life in general as more satisfying and fulfilling, and are more inclined to remember positive life events than when they are in a bad mood (Schwarz & Strack, 1999; Forgas & Bower, 1987). Moreover, mood also influences our motivation, behaviour, and evaluation of everyday interactions (Kelley & Hoffman, 1997). It has been shown that when in a good mood, people are kinder to others (and to themselves), more generous and willing to lend a helping hand, more inclined to accentuate the positive aspects of ambiguous situations, more open to new activities and ideas, and more creative than when they are in a bad mood (Isen & Levin, 1972; Clark & Isen, 1982). As a historical event, the pink cell example is notable, but painting a room is a simple and unrefined design intervention when compared to the potential inherent in state-of-the-art mood-influencing technology. Since the seventies, impressive advances have been made, especially after mood became a key topic of inquiry in the domain of interaction design (see Picard, 2000). Over the years, explorations have continued to evolve, becoming increasingly sophisticated. Recent developments in wearable technology, robotics and ambient technology, for example, have enabled the development of advanced, articulated mood-influencing designs. Figure 1 shows three examples that demonstrate some of the possibilities that are currently under investigation: social robotics and intelligent interaction (Paro; see Wada, Shibata, Saito, & Tanie, 2004), adaptive environments and dynamic ambiance (the Adaptive Relaxation Space; see Van de Garde, 2014), and affective wearables incorporating real-time, personalized mood feedback (Mood Wings; see MacLean, Roseway, & Czerwinski, 2013). Figure 1. Three examples of mood-influencing technology. In the present work, mood is defined as a mild, diffuse, pervasive feeling state that is experienced as pleasant or unpleasant, and which has a broad influence on perceptions, motivation, and behaviour.2 There are three reasons (at least) why it is meaningful to explore how design interventions can influence mood. Firstly, mood has a direct influence on people’s subjective well-being (see Diener et al., 1994). User mood may therefore be a key variable for initiatives investigating how design can foster long-term user well-being (e.g., Desmet & Pohlmeyer, 2013). As a logical consequence, research that explores the possibilities to design with the purpose to influence mood continues to emerge in the domain of (preventive) health care (e.g., Veenhoven, 2008; Javelot et al., 2014; Valenza, Gentili, Lanatà, & Scilingo, 2013). Moreover, researchers have started to explore the effects of various interiors on mood, such as in hospitals (Dijkstra, Pieterse, & Pruyn, 2008; Salonen et al., 2013), classrooms (Lundquist, Kjellberg, & Holmberg, 2002; Woolner, 2010), living rooms (Yildirim, Lutfi Hidayetoglu, & Capanoglu, 2011), and offices (Kwallek, Woodson, Lewis, & Sales, 1997; Küller, Ballal, Laike, Mikellides, & Tonello, 2006). Secondly, mood influences consumer behaviour. Research has demonstrated that consumer mood influences buying behaviour, product preference, and purchase decisions (Fedorikhin & Cole, 2004; Maier, 2012; Spies, Hesse, & Loesch, 1997). When evaluating new products, people do so more favourably when in a good mood than when in a bad mood (Gorn, Goldberg, & Basu, 1993). The same bias occurs in post-purchase evaluations (Miniard, Bhatla, & Sirdeshmukh, 1992), and even applies when people evaluate products that they have owned for a longer period of time: in a good mood, people rate the performance of their cars and television sets as better than when they are in a neutral or bad mood (Isen, Shalker, Clark, & Karp, 1978). These mood effects have particularly caught the attention of researchers in the domain of retail design. Several studies have investigated how retail design can be optimized to put consumers in the buying mood (e.g., Quartier, Christiaans, & van Cleempoel, 2009; Arnold & Reynolds, 2009). Thirdly, mood influences user behaviour. For example, Wensveen (2005) found that a person’s mood state influences the way he or she wants to operate an alarm clock. It has been shown that, when using new products, individuals in a bad mood tend to explore fewer interaction possibilities than those who are in a good mood (Venkatesh & Speier, 1999). Likewise, mood influences the kind of information that people process when interacting with technology (Zhang & Jansen, 2009), and it affects which products people (prefer to) use: A good mood increases one’s willingness and motivation to adopt and use new technologies (Djamasbi & Strong, 2008, 2010). In response to these findings, researchers have started to explore if and how interaction design can be improved with the use of mood-influencing interactions (Spillers, 2010; for examples, see Rao, 2008; Sánchez, Kirschning, Palacio, & Ostróvskaya, 2005). Surprisingly little attention has been paid to mood theory in the field of mood-influencing design research. The majority of reported design explorations are based on implicit or intuitive understandings of the mood phenomenon.3 This is problematic because intuitive assumptions about the causes of mood have been shown to be unreliable. In fact, the last thirty years mood researchers have unmasked numerous misconceptions about the influence of environmental stimuli on mood. For example, it has been shown that, contrary to popular belief, the colour red is not physically stimulating or arousing, and the colour blue is not calming or relaxing (Bakker, van der Voordt, de Boon, & Vink, 2013; O’Conner, 2011). Likewise, environmental psychologists have shown that the effect of room colour on mood is neither consistent nor predictable (Akers et al., 2012; Küller et al., 2006; Kwallek, 2005; Kwallek et al., 1997).4 This applies to other environmental stimuli too, such as light conditions (McCloughan, Aspinall, & Webb, 1999), fragrance (Herz 2002, 2009; Knasko, 1992; Retiveau, 2004), and music (Bruner, 1990; Alpert & Alpert, 1990; Ferguson & Sheldon, 2013). These studies have consistently found that environmental stimuli do not have the presupposed effects on mood when tested in real-life settings (for a discussion, see e.g., Bakker et al., 2013). These findings indicate that, unlike emotion, mood only has loose connections to discrete events, and the influence of stimuli on mood cannot be understood in isolation from the context in which the mood is experienced (Kahneman, Diener, & Schwarz, 1999).5 A sunny day, for example, does not guarantee a cheerful mood because our mood state depends on many other things. Likewise, a blue office may be soothing on one day, but irritating the next (Küller et al., 2006). For design research, it is therefore crucial to recognize that mood and emotion are different affective phenomena: Even though the words emotion and mood are often used interchangeably (both in everyday conversation, and in design research), they have different functions and causes (see e.g., Davidson, 1994; Frijda, 1994), which means that designing for mood involves different opportunities and challenges than designing for emotion. In this paper I propose two reasons why a theory of mood can be a valuable resource: It can help when resolving some of the conceptual ambiguity in the domain of experience design, and it enables us to identify new opportunities to influence mood through design. The main objective of this manuscript is to introduce a theory-based approach to design for mood regulation. This approach is detailed in a set of twenty design opportunities grouped into three main focal categories: seeking relief, restoring balance, and building resilience. The manuscript consists of three separate but related parts. The twenty design opportunities are presented and discussed in the third part of the paper. To provide a theoretical basis, the second part reports a functional explanation of the mood phenomenon that addresses four basic questions: How can mood be described, what is the function of mood, what are the manifestations of mood, and how does mood differ from emotion? The first part serves as a general introduction by providing an overview of the diversity to be found in current mood-related design research initiatives. This overview shows four basic topics that are currently receiving attention: measuring, expressing, adapting to, and influencing mood, respectively. Together, the present work aims to propel design a step closer toward the development of solid research and methods in the domain of design for mood regulation. Mood has been explored in a variety of design disciplines, including product design, fashion, architecture, graphic design, service design, and interactive technology. The domain is broad, and its focus ranges from raising users’ mood awareness, to enabling mood expressions, to developing mood-influencing tools. Without claiming to be all-comprehensive, the following section aims to provide a general overview of the variety of mood research in the domain of (interaction) design (see Appendix 1 for the review procedure). The overview is structured in four basic areas of exploration: (1) measuring mood in real-time, (2) expressing mood, (3) adapting to mood, and (4) influencing mood6. These areas are not mutually exclusive, and many of the initiatives discussed fit in combinations of two or more. Mood can be measured using a wide variety of devices and systems. The domain of real-time mood measurement is extremely dynamic, and given the scope of this paper it is not possible to provide a complete overview of current initiatives. Instead, this review attempts to encompass the diversity to be found among such initiatives (for comprehensive reviews, see e.g., Calvo & D’Mello, 2010; Ryan, 2014; Lin, 2011). Mood-measurement technology can be categorized into four broad categories7: mood assessment via (A) wearable sensors, (B) natural-contact sensors, (C) non-contact sensors, and (D) self-expression. Mood can be measured with the use of wearable devices that measure physiological signals such as heart rate, skin conductance and temperature, and respiratory rate. These devices, sometimes called “affective wearables” (Picard & Healey, 1997), come in a wide variety of forms, including (finger or ear) rings, wristwatches, arm bands, and gloves. An early example is the glove-like device Galvactivator, which measures arousal through skin conductivity (Picard & Scheirer, 2001). A more recent evolution in this technology is the development of “sensorized garments”, which are regular clothes like jackets, t-shirts and underwear with integrated sensors (see Seoane et al., 2013, 2014, for research exploration; see Nuubo, 2011, for a commercial product). In recent years, the Quantified Self movement has prompted the emergence of a range of wearable, gadget-like devices to satisfy the needs of a growing audience. Although most Quantified Self devices currently measure activity and physical fitness (using accelerometers and altimeters), newer versions are being introduced that also aim to measure mood. An example is the W/M wristband, purported to measure the four basic mood states: passive, excitable, pessimistic, and anxious (Phyode, n.d.). Slightly more sophisticated than affective wearables are the so-called natural-contact sensors, which are integrated into surfaces that users come into contact with during typical user-product interaction. Instead of requiring the user to wear sensors, the product wears the sensors in on its body or surface (Lin, 2011). The non-intrusive nature of these technologies is an advantage that leads to more natural human-product interaction. Several researchers have experimented with ‘emotional mice’ that use sensors to measure physiological signals, and thereby infer the affective state of computer users from the data they gather (cf. Ji, 2007; Lin, 2011; Sun, Paredes, & Canny, 2014). Another application of sensor technology is the Smart Wheel, a car steering wheel that measures affect while driving (Cai & Ling, 2007; Lin, Leng, Yang, & Cai, 2007). In these examples, the sensors measure physiological signals such as heart rate, skin conductance and temperature, and respiratory rate. An alternative approach is to infer mood from user behaviours. An example is a chair that captures body posture and movement data to determine user mood (D’Mello & Graesser, 2009; see also Mota & Picard, 2003). Hernandez and colleagues (2014) developed a keyboard capable of detecting states of user stress and relaxation, Alonso and colleagues (2008) developed a pen that can detect nervousness from hand gestures, while Sun and colleagues (2014) studied how mouse movements can be used to measure stress. This kind of technology has also been recently integrated into mobile communications devices. LiKamWa and colleagues (2013), for example, introduced MoodScope: a smartphone application that infers user mood from usage behaviour. Mood can also be measured using devices that do not require physical contact between the human body and a sensor. These systems are primarily visual- or audio-based, interpreting signals such as facial and voice expression, body posture, pupil diameter, and eyelid closure patterns (for a more extensive review, see Bailenson et al., 2008; Zeng, Pantic, Roisman, & Huang, 2009). Interestingly, several studies have indicated that trained observers can ascertain mood from the body postures of subjects video-recorded in a natural setting (cf. Thrasher, van der Zwaag, Bianchi-Berthouze, & Westerink, 2011). Recently, researchers have begun to develop algorithms that can replace such expert observation. There has been noteworthy progress in this area, resulting in the introduction of several automated face analysis (AFA) systems that code facial expressions (for a recent discussion on AFA, see Cohn et al., 2014). Examples are the computer expression recognition toolbox (Littlewort et al., 2011) and the FaceReader (see Terzis, 2011). However, any opportunity for mood measurement is limited, because unlike emotions (such as fear, anger, or disgust), moods do not own their own unique facial expression (Ekman, 1994). Moreover, most systems require posed facial expressions in a neutral setting, and are not reliable when used in natural settings. The fourth category represents technology that enables people to express their momentary mood state. Wensveen and colleagues (2002) developed an alarm clock that allows users to convey how they feel about their wake-up time. Another example is the text messaging service eMoto developed by Fagerberg and colleagues (2003, 2004). Shaking or swinging this device enables users to adjust the visual appearance of their text message to convey their affective state. One example of a commercial application is the MoodPad developed for hotel guests by Philips (2008). With this so-called ambient controller, guests can personalise lighting, temperature, curtain and soundtrack settings according to their mood. What sets this controller apart from regular remote controls is that users can also select a pre-configured mood (such as ‘romantic’) rather than adjusting the room settings individually. Apart from these devices, a host of online applications that enable users to manually track their mood, such as Moody-Me, MyMoodTracker, MoodChart, and many more, are now widely available. Interactive technology can be used to create all kinds of expressive mood manifestations. Perhaps the most direct way is via mood-expressive clothing, which can enable an intimate form of self-expression (for an overview, see Uğur, 2013). Stead and colleagues (2004), for example, developed an emotional wardrobe, including garments that express the affective state of the user, and Stylios and Yang (2013) presented a collection of clothes that change colour to correspond with user mood, which they coined MoodWear. Beyond transmission, some researchers have explored additional purposes for technology-assisted mood expression. One approach is to support personal mood management. An example developed by MacLean and colleagues (2013, Figure 1) is Mood Wings, a robotic butterfly attached to a wristband. The wings beat at different rates depending on wearers’ mood state, which encourages personal mood awareness. Besides monitoring transitory mood, technology can also be used to provide more long-term mood awareness. An example is AffectAura, a system that allows users to reflect on their mood states over long periods of time (McDuff, Karlson, Kapoor, Roseway, & Czerwinski, 2012). The system measures mood continuously, and an interface communicates these mood developments, which encourages users to reflect on their long-term mood memory. Likewise, many of the available mood tracking apps (like Moody-Me and MoodChart, see above) visually render mood data to buoy users’ efforts to manage their personal mood. A second potential purpose for technology-assisted mood expression is to support effective social interaction. El Kaliouby and colleagues (2006a) describe the development of social-emotional prosthetics, devices that aim to enhance users’ social-emotional intelligence skills. Primarily developed for people with autism, these systems help users to interpret the mood states of people they interact with (see El Kaliouby, Teeters, & Picard, 2006b, for an overview). Sánchez and colleagues (2005) developed a mood-oriented instant messaging interface that provides a visual mood representation. This interface enables users to convey their long-term mood by supplying emoticons that are suited to persistent states. Fessl and colleagues (2012) developed MoodMap, an app that enables users to track their own mood and the moods of their team members during virtual meetings. Their study indicated that the resulting mood-awareness enhances interpersonal communication. A final example is MobiMood, a mobile social application that enables friends to share their moods with each other (Church, Hoggan, & Oliver, 2010). Their study indicated that mood sharing and mood awareness appear to be effective springboards for conversations and increased communication among users. When mood is measured in real-time, the resulting data can be used to responsively adapt digital interfaces and environments to match a user’s mood. An example is a smartphone music player that tailors the playlist to suit users’ moods by analysing their facial expressions (U.S. Patent No. 8094891B2, 2012). In the domain of interactive architecture, “affective architecture” explores how the built environment can be programmed to respond to inhabitants’ moods by changing shape, colour, temperature, humidity and other features (Bonnemaison & Yates, 2011; Gross & Green, 2012; Negroponte, 1975; Oosterhuis, 2005). Several authors have explored how the environment can respond to human mood through implicit feedback from an occupant, for example by taking data from the human body. Carneiro et al. (2013) explored how workspaces that are aware of their user’s mood state can be developed, and how such spaces could continuously and dynamically adapt environmental conditions to reflect these moods. The aim of these authors is to create more harmonious working environments, with effects on interpersonal relationships, productivity, quality of work and health. Along similar lines, the Philips MoodPad (Philips, 2008; see above) enables hotel guests to optimise the fit between room ambience and mood, while Mennicken and colleagues (2014) developed the EmotoCouch, a couch prototype that was conceived to explore how furniture can express moods through colour and light. Davis and colleagues (2013) developed the Textile Mirror, a wall panel that aims to reflect occupants’ affective states by mapping mood to textile panels that shift in real-time (occupants track their moods via a mobile application). From environments that adapt to user mood, it is a small step to further explore how ambient interiors can influence user mood. Kuijster and colleagues (2012) explored how a combination of functional and atmospheric lighting can improve the moods of elderly people. Baños and colleagues (2006, 2012) demonstrated that virtual environments could be used to induce positive moods with the aim of enhancing elderly well-being. The Textile Mirror described above (Davis, Roseway, Carroll, & Czerwinski, 2013) was developed to enable users to modify their mood state by transforming the feel of the fabric. A more inclusive design is GRIP, a smart ambient space designed to actively influence the mood of office workers (Van de Garde, 2014; see Figure 1). This environment reacts to human presence by configuring a personal space of varying size, soundscape and brightness, and stimulating paced breathing and meditation, which helps employees who are in a bad mood to recover and regulate their mood. The potential to influence mood by means of ambient environments has not only been explored in architecture, but also in the domain of mobility design. Ho & Spence (2013), for example, studied how responsive interior car design can influence the mood of car drivers. Likewise, interactive products can adjust their interaction style to influence mood. The “intelligent pen” developed by Alonso and colleagues (2008) and described above influences user mood by shifting its weight distribution. In health care, a new category of product development is currently underway that focuses on patient mood management. These social robots, or “care robots”, actively aim to improve patient mood.8 One of the most prominent products in this domain is Paro, a therapeutic robot modelled after a baby harp seal (NIAIST; National Institute of Advanced Industrial Science and Technology, n.d.; see Figure 1). Paro was designed to have a calming effect, and nurture a positive mood in hospital and nursing home patients, similar to animal-assisted therapy (Wada et al., 2004; Wada & Shibata, 2007). A variety of similar therapeutic social robots are available, and more are being introduced every year. Examples are the interactive bear by Fujitsu Robotics (Robotsnu, n.d.) and the robotic cat JustoCat (Robyn Robotics, n.d.). The domain of mood-focussed design research is both diverse and robust. Researchers are inspired by potential design applications that include therapy (e.g., affective prosthetics), self-development (mood tracking apps), communication, work efficiency, entertainment, artistic expression, comfort and general well-being. Many initiatives utilize some form of mood measurement, either via sensors that measure (psycho-) physiological signals or behavioural expressions (e.g., hand movement with mouse or pen, body movement with chair), or through some kind of self-reporting. Most of the devices measure basic dimensions of mood (like pleasure and arousal) rather than discrete mood states (like grumpiness and cheerfulness). Likewise, most measure the basic dimension of physiological arousal. In some cases, the dimension of arousal is augmented with a second dimension, which can be hedonic tone, dominance, or engagement. When self-report is used, it is recorded using a single bi-polar scale (bad mood–good mood), and in some cases it is possible to select one or more discrete mood labels from a predefined set. Once mood has been measured, the next step is to translate the data into some kind of designed expression. In most cases, this designed expression is ambiguous, or left open for interpretation by the user. Decisions about how these expressions might represent mood states are mostly based on aesthetic considerations. The most oft-used expression is coloured light (e.g., mood-ware; EmoCouch), although some other examples exist, like responsive surface texture (e.g., Textile Mirror) or object behaviour (e.g., Mood Wings). These design-mediated mood expressions can enable self-expression, support social interactions, and support mood-management. 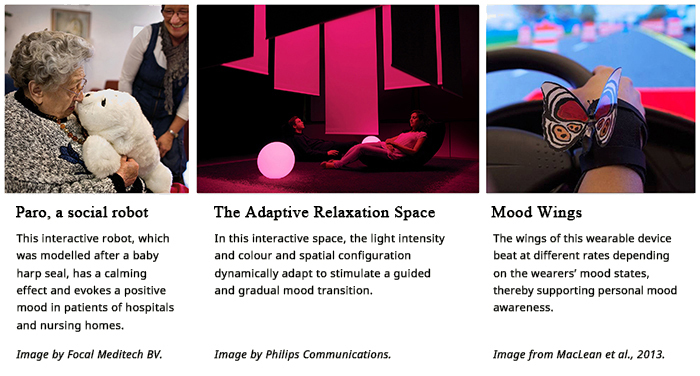 A second category of initiatives includes mood-focussed technology that does not rely on mood measurement, like Paro or the Adaptive Relaxation Space shown in Figure 1. Usage can be initiated by the user (i.e., the user wants to regulate his or her mood) or by some other party (i.e., the user may not be aware that mood-influencing technology has been introduced). Most of the reviewed work that explored the mood-influencing possibilities of design does not report underlying hypotheses surrounding the kind of design features or qualities that might affect mood in a particular way. This limited theoretical substantiation has several unwanted consequences. Firstly, by building on intuitive assumptions about the causes of mood, only a limited repertoire of strategies to influence mood has been explored. Secondly, not all of the explored strategies may be effective because many of the underlying intuitive assumptions have been shown to be unreliable (see introduction for an overview). Thirdly, the lack of precision has created conceptual confusion by enabling design researchers to overlook important differences between causes and manifestations of emotions and moods. Because these three consequences hinder the progression of the field, the next two parts of the manuscript introduce a basic mood theory and a set of theory-based design opportunities. Mood is a diffuse and general feeling state that provides the affective colouring for all day-to-day events (Morris, 1989). Unlike emotions, moods are not directed toward specific targets, but instead have a broad influence on one’s perceptions, judgments, and behaviour (Kelley & Hoffman, 1997; Martin & Clore, 2013). This means that one’s mood is not directed at anyone or anything in particular, but rather at the surroundings in general, or, in the words of Frijda (1994), at “the world as a whole” (p. 60). In other words, moods represent positive and negative frames of mind that subtly influence our responses to all the events we encounter: when ‘in a mood’, a person sees the world – and everything in it – as dim and grey, while when cheerful, the same person sees the world through rose-coloured glasses. Where emotions are usually elicited by an explicit cause (e.g., some event), moods have diffuse or combined causes. Consequently, we are usually unable to specify the cause of a particular mood (Ekman, 1994). Although limited in time, moods tend to have a relatively long-term character. One can be sad or cheerful for several hours, or even for several days (Beedie, Terry & Lane, 2005). The second part of the paper provides a functional explanation of the mood phenomenon. To this end, four basic questions are addressed: how can mood be described? what is the function of mood? what are the manifestations of mood? and how does mood differ from emotion? The approach of this analysis was pragmatic: reviewing theory available in psychology and philosophy, and collecting those insights that enable a functional analysis of human mood in the context of design interventions. The analysis was mostly based on the functional view on mood developed by Morris (1992, 1998, 1999, 2000), complemented with insights from the work on the nature of the mood phenomenon (e.g., Lazarus, 1991; Parkinson, Totterdell, Briner, & Reynolds, 1996), the strategies that people employ to influence their own moods (e.g., Gross, 2007; Larsen, 2000), and techniques to regulate mood (e.g., Martin, 1990; Schneider, Gur, Gur, & Muenz, 1994). So far, we have not explicitly described moods. Naturally, the mood repertoire is far more nuanced than the basic good-bad distinction would have us believe: an individual can experience a range of moods that are perceived as good (e.g., cheerful, relaxed, elated) or bad (e.g., gloomy, grumpy, nervous). 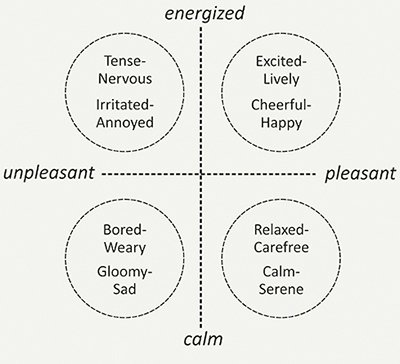 A common approach to capturing the breadth of this variety is to use basic dimensions that identify mood categories. In this tradition, Watson and Tellegen (1985) proposed a two-factor model of mood that employs both of the dimensions that consistently emerge in studies on the affective structure of moods, across languages and cultures (Watson & Clark, 1994; Watson, Clark & Tellegen, 1988): valence (pleasure–displeasure; representing the good/bad distinction) and arousal (high energy–low energy). Together, they combine to form four basic mood categories, as depicted in Figure 2. These four categories have been shown to account for roughly one-half to three-quarters of the common variance in mood terms (Watson, 1988): energized–unpleasant, energised–pleasant, calm–unpleasant, and calm–pleasant. Figure 2. Eight basic mood types (Desmet et al., 2012) in four mood categories (Watson and Tellegen, 1985). Each category represents a variety of distinguishable mood types (Watson & Tellegen, 1985). Calm-unpleasant, for example, represents mood types such as feeling bored, dejected, depressed, weary, fatigued, gloomy, inert, miserable, and sad (Lorr & McNair, 1988; Lorr, McNair & Fisher, 1982; Russell 1980; Watson & Clarck, 1994). Desmet, Vastenburg, van Bel, & Romero, (2012) assembled a set of eight basic mood types, two for each category (see Figure 2). This set, representing the main mood differentiations found in the typologies of nine mood theorists, aims to balance fine-grained distinctions with a more comprehensive overview: it is concise, yet adds nuance to the four basic categories.9 While it does not capture every nuance, this set of eight mood states does embody the general variety of human moods. The explanation of mood set forth here is based on the proposition that moods are functional. They are evolved psychological mechanisms that accomplish particular objectives to protect and increase our well-being (as proposed in evolutionary psychology; see Buss, 1995).10 The essence of this view is that mood is best considered a monitoring system that enables us to maintain a healthy balance between the availability of our personal resources and the perceived demands of everyday life. More specifically, moods serve as a cue that signals the degree to which these resources are sufficient to meet the current level of demands (Morris, 1992). A positive mood signals a surplus of resources that inspires us to actively seek out new challenges (e.g., help a friend, start a project, try a new recipe). A negative mood signals a shortage of resources that prompts us to withdraw from ongoing challenges (e.g., stay at home, cancel a weekend trip, avoid demanding colleagues). This means that the mood system helps us to maintain homeostatic balance between our perceived resources and environmental demands (which require resource investments), promoting conservation when resources are low and expenditure when they are high. This balance is visualised in Figure 3. Figure 3. Mood homeostasis (robot cartoons excerpted from Desmet et al., 2012). Figure 3 illustrates that we are constantly experiencing some kind of mood, and that the valence and intensity of our moods is determined by the dynamic disparity between resources and demands. In a good mood, attaining most goals seems possible and challenges seem surmountable, while a bad mood seems to take the wind out of our sails. Mood thus operates as a cue in a self-regulatory system that controls goal-directed behaviour. The underlying idea is that readiness to engage in a potentially taxing, goal-directed activity is generally advantageous for our well-being. Investing our personal resources by seeking out challenges will enable us to flourish through the (incremental) attainment of those goals. Positive moods thus stimulate us to invest our resources (Figure 3, right). However, our resources are limited, and we need to ensure that we do not face more demands than we can cope with. 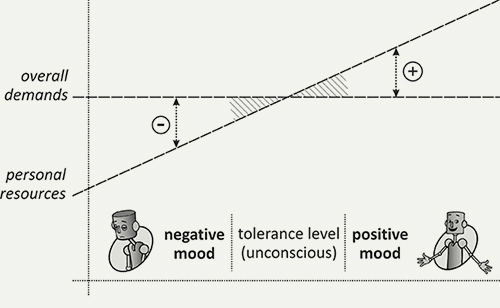 Negative moods prompt us to withdraw from challenging situations in order to conserve and replenish our resources (Figure 3, left). We have various kinds of resources, the most fundamental being physical energy (Thayer, Newman, & McClain, 1994). Other kinds of resources are social, intellectual, material and financial. Similar to our physical energy, these resources are not fixed, but influenced by internal and environmental factors (Morris, 1992). The balance in Figure 3 indicates that mood is not predicted by resource level in itself, but by the disparity between the resources available and the perceived demands (Morris, 1992). In order to maintain a homeostatic balance, the mood system influences how one feels, thinks, and behaves. The self-correcting system acts to regain control once the defended threshold value that is passed. Overall, negative moods discourage active involvement in the pursuit of environmental goals (i.e., low willingness to engage), nudging us to sit and think, be alone, and take naps. Conversely, positive moods encourage investment in enthusiastic, outwardly directed action (i.e., high willingness to engage), spurring us to engage in social, strenuous and leisure activities (Cunningham, 1988). Numerous effects of mood on thought and behaviour have been shown (for reviews, see Hunsinger, Isbell, & Clore, 2012; Martin & Clore, 2013). For example, in a good mood, people are more outgoing, friendly and outward-focussed, scanning the environment to identify opportunities (Morris, 1992). They have stronger motivation and sense of control, and, related to this, they take more risks and have higher expectations for success. They are generally more optimistic in their evaluations and judgements. Isen et al. (1978) also found that in a good mood, people rate the performance of their cars and television sets higher than when they are in a neutral or bad mood. Finally, in a good mood, people are more creative, better at problem solving, and make faster decisions (Parkinson et al., 1996). The words ‘mood’ and ‘emotion’ are regularly used interchangeably, both in everyday language and in (design) research. They do, however, refer to different, specific experiential phenomena. Even though they both represent affective systems, they differ in terms of eliciting conditions and experiential and behavioural manifestations. In design and emotion research, it can therefore be advantageous to distinguish between them. Table 1 summarizes their similarities and differences. Table 1. Emotion versus mood. Mood and emotion are both monitoring systems that serve related (but different) functions in protecting and increasing our well-being. They have evolved in order to signal when things are wrong for us (negative feeling) or when things are right for us (positive feeling) (Schwarz & Clore, 2003). The key difference is that mood has an internal focus (monitoring the internal state), whereas emotion has an external focus (monitoring the environment) (Morris, 1989). Emotions are evoked through events are construed as threats (negative emotion) or opportunities (positive emotion). Because these events require our immediate attention, the emotion interrupts ongoing thought and behaviour with emotion-specific action tendencies (e.g., to withdraw, attack, approach, examine, etc.) that aim to neutralize the threat or capitalize on the opportunity (Frijda, 1996). Compare this with moods, which influence rather than interrupt our ongoing thought and behaviour (Davidson, 1994): A good mood increases, and a bad mood decreases our general willingness to engage in all of our ongoing undertakings. As an example, take the activity of chairing a project team meeting. Compared to a chair who is in a good mood, one who is in a bad mood might be less patient towards the team members, less proactive in suggesting new plans, or not as keen on accepting follow-up tasks. In sum, negative emotions empower us to neutralize immediate threats, and positive emotions empower us to act upon immediate opportunities. Conversely, negative moods stimulate us to preserve personal resources by avoiding demanding situations, and positive moods stimulate us to invest personal resources by exploring and seeking out new opportunities. Mood theory provides us with a simple, yet crucial insight for design: mood is not a response to external stimuli. Whereas emotions are direct responses to external events, mood is a diffuse experience of the balance between one’s overall personal resources and one’s life challenges. This insight predicts that design interventions (like changing room colour or ambiance) do not have a direct impact on mood, which explains why studies that investigate the impact of environmental manipulations on mood generally fail to find the predicted effects (see introduction). This does not mean, however, that design cannot influence mood. The mood regulation literature tells us that people influence their mood with all kinds of intentional activities, and I propose that design can have an indirect influence on mood by deliberately supporting these mood-regulating activities. To this end, the third part of this paper introduces twenty regular mood-regulation strategies, and proposes how these strategies can be used to inspire mood-regulation design. People often attempt to influence their mood: When they are in a bad mood, they try to get themselves out of it, and when they are in a good mood, they try to prolong it (Thayer, Newman, & McClain, 1994). In these attempts, they make use of a wide range of mood-regulation strategies (Morris & Reilly, 1987), actions that can be both behavioural (e.g., sporting activity) or mental (e.g., thinking about pleasant memories). Note that mood management is so integrated into our daily activities and habits that we often regulate our moods without being aware of doing so (Parkinson et al., 1996). Someone who is in a bad mood may, for example, call a friend, take a walk or look at family pictures, without forming the conscious intention to relieve their negative state. The diversity of mood-regulation strategies is vast, ranging between drinking alcohol, listening to music, meditating, repressing the mood and seeking help. To provide an overview, Table 2 groups a broad range of activities into 20 basic mood regulation strategies. The activities and strategies have been drawn from the work on mood regulation by Koole (2009), Morris (2000), Morris and Reilly (1987), Gross (1998, 2011, 2013), and Thayer et al., (1994). First, a long list of 83 activities (third column in Table 2) was assembled from these publications. Next, the author and an experience design researcher clustered these activities into 20 main strategies, and sorted these into three categories11, each of which represents a specific mood-regulation focus: (A) finding relief, (B) restoring balance, and (C) building resilience. Table 2. 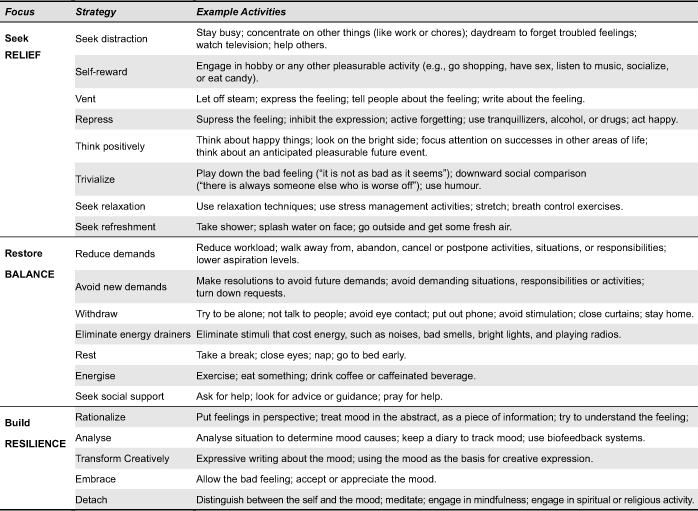 Twenty activity-based mood regulation strategies in three categories. Mood-regulation strategies with a relief-focus (category A) aim to alleviate the unpleasant feeling associated with a bad mood. The primary purpose of these strategies is to feel better, regardless of what caused the bad mood. They include physical activities like taking a shower or going shopping, and mental activities like thinking about pleasurable memories or trying to trivialize the bad feeling. Strategies with a balance-focus (category B) aim to correct the imbalance between one’s available resources and the demands that require spending these resources. Instead of merely alleviating the bad feeling, these strategies aim to resolve the bad mood by reducing the underlying causes. These are actions that either increase one’s personal resources (e.g., going to bed early, and asking for help) or reduce the environmental demands (e.g., reducing workload, and lowering expectations). The third category (category C) includes mood-regulation strategies that employ the bad mood as a means for personal development. Rather than trying to reduce the causes of the mood or the associated negativity, these strategies aim to transform the bad mood into something constructive. These actions are more reflective and holistic than those in the first two categories, with a focus on mood resilience and long-term well-being (see Koole, 2009 for a discussion). Note that mood-regulating activities can function on different levels, depending on the underlying motivation. Talking to a friend, for example, can be a pleasant distraction from a bad mood (relief-focus), but it can also initiate social support (balance-focus). The conversation can have a reflective nature, helping the person to learn from his or her bad mood (resilience-focus). Moreover, some activities that people typically engage in to improve their mood operate on more than one level simultaneously. An example is yoga: Engaging in yoga exercises can help individuals to relax and alleviate bad feelings, restore their resource-demand balance, stimulate mood awareness and build mood resilience (Hartfiel, Havenhand, Khalsa, Clarke, & Krayer, 2011). None of the 20 mood-regulating strategies necessarily rely on or require designed interventions. A person can, for example, vent her mood by shouting out loud during a walk on the beach. She can find a moment of self-reward by taking a stroll in the afternoon sun, reduce demands by cancelling a meeting, and increase her resources by taking a nap. At the same time, we use all kinds of products and services during their mood-regulating activities: the phone used to call a friend for help, the cup used to drink an energizing coffee, the digital calendar used to schedule a meeting, the pillow used to cry on, and even the iron, used to keep ourselves busy to distract us from our heart pains. It seems specious to label these products as mood-regulating, as their contribution to mood-regulation is peripheral. We can, however, also imagine products that have the deliberate intention to enable, support, and inspire people to engage in mood-regulating activities. In light of this potential, I propose that each of the 20 strategies can be a source of design inspiration. Figure 4 shows two examples.12 The Grumble Bubble was designed to enable and stimulate venting (Strategy 3 in Table 2). The device is to be placed on the shore of the river flowing through a city centre. People can whisper, speak, or shout their burdens and complaints into a bright yellow trumpet. These burdens are then transformed into little bubbles that are washed away by the river’s tide. The device invites people to seek some relief by venting their feelings. The Happiness Tree, which is placed in office environments, was designed to enable and stimulate office workers to engage in a brief moment of relaxation seeking (Strategy 7 in Table 2). The tree has two handles that are attached to ropes. 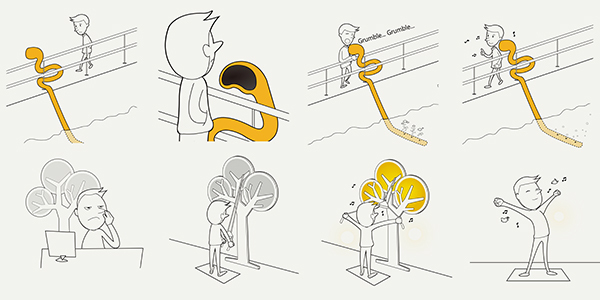 By pulling the ropes, the user is guided into a yoga stretch pose and, at the end of the pose, rewarded with a warm yellow light and the sound of a bird chirping. Figure 4. Two designs for mood regulation. We can easily imagine how the strategies of venting and seeking relaxation can generate many more designs, depending on user group and context of use. An office lamp, for example, can help users calm their breathing by subtly mimicking a relaxed breathing rhythm (relaxation). Moreover, designs can be based on all other mood-regulation strategies. Examples could be a secret little drawer in the workspace desk that hides some candy (self-reward), a support button on the computer that, when pushed, momentarily displays images on screen of people that can be relied on (social support). Besides their utility as inspiration for design, this collection of 20 regulation strategies can also be useful when categorising existing mood-regulation designs. Take, for example, the three products in Figure 1. Paro, the seal robot, is an example of a product that influences mood by providing a positive distraction (Strategy 1 in Table 2). The Adaptive Relaxation Space enables a moment of withdrawal (Strategy 11 in Table 2), and the Mood Wings enable people to rationalize their mood (Strategy 16 in Table 2). These examples illustrate that designs can differ in their focus: whereas the Paro robot offers some relief from a bad mood by alleviating a negative feeling (i.e., relief-focus), the Adaptive Relaxation Space helps people to restore their resource-challenge balance (i.e., balance-focus), and the Mood Wings enable users to increase their mood awareness (i.e., resilience-focus). It has been shown that the activities that can improve mood are the very same activities that are less likely to occur during bad moods (Morris & Reilly, 1987). It may be that the person in a bad mood does not feel like initiating such activities, because the reward seems less attainable or attractive than usual, or simply because the bad mood makes one too tired to put out the effort (Clark & Isen, 1982). Morris and Reilly (1987) propose that a supportive social network can contribute favourably to homeostatic balance, because friends or family may force us to engage in mood-regulating activities that we wouldn’t do if left to our own devices. Perhaps products can serve a similar function: More than merely enabling mood-regulating activities, design can inspire and stimulate people to engage in these activities. For example, people may only come up with the idea to vent their frustrations, or even become aware that they have frustrations to vent, after encountering the Grumble Bubble. Likewise, the Happiness Tree does not only enable office workers momentary relief, having it in the office reminds office dwellers of the importance of short bouts of rest, and inspires the general incorporation of stress-relieving activities into daily work routines. Not all 20 strategies are equally popular: People often favour strategies with a relief-focus over those with a balance- or resilience-focus (Thayer et al., 1994). It has been proposed that these strategies are more popular because they have an immediate effect on mood (Morris & Reilly, 1987). Unfortunately, they are also less effective than the other strategies, because even though they provide immediate mood relief, this relief is only temporary, as it does not address the cause of the bad mood (Parkinson et al., 1996). The strategies with a balance-focus provide a more structural mood improvement, and the strategies with a resilience-focus can enable people to enduringly increase overall mood balance (see Figure 3). It would be interesting to explore how design can elicit a balanced approach to improving moods by offering a layered form of mood regulation that includes all three foci. The Adaptation Relaxation Space in Figure 1 could be interpreted as an example of such a layered approach. People may be motivated to use the space because the enjoyable, colourful and dynamic ambiance offers a certain degree of positive distraction (strategy 1). At the same time, however, engaging with the space allows users to avoid new demands (strategy 10) a context for rest (strategy 13), and perhaps even a setting to practice mindfulness or meditation (strategy 20). A promising direction for additional design research is to explore how design interventions can offer such layered approaches to mood regulation, enabling both short term mood relief and longer-term mood repair and resilience. The impact of designed interventions on mood is not as strong as is sometimes assumed because one’s mood is not a direct response to an external stimulus. Instead, it is an expression of the overall balance between an individual’s personal resources and the challenges that require these resources. Nonetheless, mood can be regulated by engaging in particular activities, and these activities suggest a multitude of design opportunities: design can enable, support, and inspire people to engage in the activities that have a positive impact on mood. In this paper, I have proposed a collection of 20 mood regulation activities, each a potential source of design inspiration. The collection may broaden the repertoire of mood-influencing design variables and support design researchers in developing a more explicit rationale for mood-focussed design intentions. Increasing our understanding of how design can influence mood is relevant and timely, as the domain of mood-managing technology is rapidly expanding. Although many of the recent initiatives in mood-influencing technology are exploratory in nature, we are currently witnessing an accelerating translation from these academic explorations into commercially available products, services, and systems. The Para robot in Figure 1 is an example of a product that is now available to care institutions and individuals who are willing to make the investment. Numerous examples of commercial devices are currently available to followers of the Quantified Self movement that has been gathering momentum since 2007. The number of wearable devices sold is expected to grow to 485 million in 2018, and when this figure includes software apps, projected sales reach into the billions (ABI-Research, 2014). Besides its business potential, mood-focussed design is also relevant as a means to contribute to human health and happiness. Mood is not only a key determinant of positive well-being (Morris, 1999), but also of ill-being. Indeed, a durable disturbance of mood (implicating both deficient positive and excessive negative mood) is found to be one the main underlying features of major clinical depression (see Gordijn et al., 1994; Lewinsohn & Amenson, 1978; Peeters, Berkhof, Delespaul, Rottenberg, & Nicolson, 2006; Rottenberg, 2005). Depression, and other mood “disorders”, represent a group of diagnoses where a disturbance in the person’s mood is the main underlying feature (American Psychiatric Association, 2013). The World Health Organization (2012) has reported that globally, more than 350 million people of all ages suffer from mood disorders, making mood-influenced ill-being the leading cause of disability worldwide, and a major contributor to the global burden of disease. Given the direct relationship between mood and both well- and ill-being, products, environments, and services that support appropriate moods should be considered a necessity rather than a luxury. Additional research is required to explore how the 20 opportunities can be utilized in design activities. Even though all 20 activities in Table 2 might offer design inspiration, not all of them are free of risk of harm. For example, some of the things people do to improve their mood may be momentarily effective, but cause greater (mood) problems in the long run (Thayer, 2001); two obvious examples are drinking alcohol and using drugs (strategy 4), which have been shown to be potentially harmful (e.g., Parkinson, 1996). Likewise, the other strategies should be used with care. Waking away from responsibilities (strategy 9), for example, may be effective on the short term, but if carried out irresponsibly, purposeful relinquishment of responsibility can generate harmful effects, not only for the individual but also for others (imagine flight controllers deciding to close their eyes for a couple of minutes to reenergize). Design explorations should take such considerations into account when creating ideas that are not only effective but also responsible, realistic and appropriate. Related to this, additional ethical issues in design for mood also require further attention. For example, design that wilfully influences mood should find the right balance between determination and freedom (see Dorrestijn & Verbeek, 2013). At least two additional opportunities for future research can be identified. The first is to study how a negative impact of design on mood can be prevented. There is an exception to the rule that external stimuli do not directly influence mood. This concerns energy drainers, such as noise, inappropriate lighting, or other causes of discomfort. These external conditions have a direct impact on mood because they attack and drain our personal resources (see Bluyssen, Aries, & van Dommelen, 2011). Obviously, environments should be designed with the intention of minimising such energy drainers (see strategy 12). It is not clear, however, if the opposite also applies: future research can explore whether and how environments might be designed to improve mood by offering energy replenishment. The second is to explore the motivations that people have for regulating their moods. Mood regulation does not always aim to change mood, but may instead aim to maintain a mood (Parkinson et al., 1996). Depending on the circumstances, we may try to keep ourselves in a good, neutral, or bad mood (Tice & Bratslavsky, 2000). Although the most common motive for mood regulation is to get out of bad moods, good moods may even occasionally be intentionally transformed into bad ones (e.g., Parrott, 1993). In situations in which good moods are deemed inappropriate or disadvantageous (e.g., as a result of social norms, such as during funerals) people may deliberately try to put themselves in what could otherwise be construed as a bad mood (see Morris & Reilly, 1987). Likewise, in certain situations, a neutral mood might be preferred over a positive mood, for example when people have to interact with a stranger (Erber, Wegner, & Therriault, 1996). These alternative motives for mood regulation can offer new directions for design research. Eventually, increasing our understanding of how design can support mood-regulating activities, both in the short term by offering relief, and in the long-term by supporting mood repair and mood resilience, can contribute to the body of knowledge on positive design (see Desmet & Pohlmeyer, 2013), supporting designers in their attempts to design for human flourishing. This paper is dedicated to the memory of Nico Frijda. The research was supported by the MAGW VIDI grant number 452-10-011 of The Netherlands Organization for Scientific Research (N.W.O.) awarded to P.M.A. Desmet. The three pictures in Figure 1 are reprinted with permission, and the sketches in Figure 4 were made by Hui Lin. I express my gratitude to copyeditor Jianne Whelton and to Boudewijn Boon for his contribution to the mood research literature review. 1. The popular notion regarding the soothing effect of pink persists even today. A recent example is a Swiss prison that, in 2013, painted 30 prison cells pink. In an interview, a police spokesman stated, “It really seems to work. They quieten down and go to sleep much more quickly in a pink room” (Spottiswoode, 2013). 2. This definition is based on the work of Clark and Isen (1982), and has been formulated to align with the functional view of the mood phenomenon as developed by Morris (1992, 1998, 1999, 2000) and Parkinson and colleagues (1996). 3. Many researchers use descriptive theory (e.g., core affect, or the circumplex model of affect) to describe the mood phenomenon, but only a few make use of theory that explains the causes and effects of mood, or the conditions that influence mood. 4. With respect to the pink prison example: recent research has invalidated the results of the original pink-prison study, exposing the presumed soothing effect of pink cells as an urban myth (for a discussion see O’Connor, 2011). 5. O’Connor (2011) proposed that the findings of such studies are limited, because they aim to isolate the effect of a single type of stimulus (like colour) from what is actually a complex and subjective phenomenon. 6. This categorization compares to the one of Spillers (2010), who proposed three categories: Products that offer detection, indication, and inducement of moods. 7. The distinction between wearable and natural-contact sensors was introduced by Lin (2011). 8. Numerous studies have explored how the mood of humanoid robots and virtual agents can be expressed dynamically by facial expression, gestures, and body postures. Some initiatives have focused on how mood can be expressed with facial expressions, whereas others have focused on (or included) bodily expression (for an overview, see Xu et al., 2014). Examples of the former are explorations performed using the robot head Kismet (Breazeal, 2002), the humanoid robot head ROMAN (Hirth et al., 2011), and the desktop robot iCat (Bartneck et al., 2004). Examples of the latter are explorations performed using the NAO robot developed by Alderbaran Robotics (Haring, et al., 2011), the KOBIAN robot (Zecca et al., 2009), and the Honda humanoid robot (see Salem et al., 2012). 9. Mood typologies have been included that were reported by Watson & Clark (1994), Lorr & McNair (1988), Lorr, McNair & Fisher (1982), Russell (1980), and Matthews, Jones & Chamberlain (1990). Note that even though negative moods show more differentiation than positive moods, it was decided to include an equal number of positive and negative moods to allow for a balanced instrument (for a discussion on balance in affect scales, see Desmet, 2002). 10. Vincent Nowlis and Helen Nowlis (1956) were among the first to introduce the functional view of the mood phenomenon, and this view was later developed by William Morris (1989, 1992, 1999, 2000). More recently, the functional perspective of mood is represented in the domain of positive psychology (cf. Cummins, 2010). 11. These three categories are loosely based on the three functions of emotion regulation proposed by Koole (2009). 12. Both designs were created by students of the Faculty of Design Engineering of Delft University of Technology. ABI-Research. (2014). Wearables beyond the hype. Retrieved February 25, 2015, from http://www.abiresearch.com/market-research/product/1020251-wearables-beyond-the-hype/. Akers, A., Barton, J., Cossey, R., Gainsford, P., Griffin, M., & Micklewright, D. (2012). Visual color perception in green exercise: Positive effects on mood and perceived exertion. Environmental Science & Technology, 46(16), 8661-8666. Alonso, M. B., Keyson, D. V., & Hummels, C. C. M. (2008). Squeeze, rock, and roll; Can tangible interaction with affective products support stress reduction? In Proceedings of the 2nd International Conference on Tangible and Embedded Interaction (pp. 105-108). New York, NY: ACM. American Psychiatric Association. (2013). Diagnostic and statistical manual of mental disorders (DSM-5). Arlington, TX: American Psychiatric Association. Andreasson, F. M. M. (2012). U.S. Patent No. 8094891B2. Washington, DC: U.S. Patent and Trademark Office. Arnold, M. J., & Reynolds, K. E. (2009). Affect and retail shopping behavior: Understanding the role of mood regulation and regulatory focus. Journal of Retailing, 85(3), 308-320. Bailenson, J. N., Pontikakis, E. D., Mauss, I. B., Gross, J. J., Jabon, M. E., Hutcherson, C. A., Nass, C., & John, O. (2008). Real-time classification of evoked emotions using facial feature tracking and physiological responses. International Journal of Human-Computer Studies, 66(5), 303-317. Bakker, I., van der Voordt, T. J., de Boon, J., & Vink, P. (2013). Red or blue meeting rooms: does it matter? The impact of colour on perceived productivity, social cohesion and wellbeing. Facilities, 31(1/2), 68-83. Baños, R. M., Etchemendy, E., Castilla, D., Garcia-Palacios, A., Quero, S., & Botella, C. (2012). Positive mood induction procedures for virtual environments designed for elderly people. Interacting with Computers, 24(3), 131-138. Baños, R. M., Liaño, V., Botella, C., Alcañiz, M., Guerrero, B., & Rey, B. (2006). Changing induced moods via virtual reality. In W. A. IJsselsteijn, Y. de Kort, C. Midden, B. Eggen, & E. van den Hoven (Eds. ), Persuasive technology: Lecture notes in computer science (pp. 7-15). Berlin, Germany: Springer. Bartneck, C., Reichenbach, J., & Breemen, A. J. N. (2004). In your face, robot! The influence of a character’s embodiment on how users perceive its emotional expressions. In A. Kurtgözü (Ed. ), Proceedings of the 4th International Conference on Design and Emotion, (pp. 32-51). Ankara, Turkey: Middle East Technical University. Beedie, C. J., Terry, P. C., & Lane, A. M. (2005). Distinctions between emotion and mood. Cognition and Emotion, 119(6), 847-878. Benton, D., & Donohoe, R. T. (1999). The effects of nutrients on mood. Public Health Nutrition, 2(3a), 403-409. Bluyssen, P. M., Aries, M., & van Dommelen, P. (2011). Comfort of workers in office buildings: The European HOPE project. Building and Environment, 46(1), 280-288. Bonnemaison, S., & Yates, S. (2011). Design process for interactive architecture at the @Lab. In L. Hallnas, A. Hellstrom, & H. Landin (Eds. ), Ambience 11: Where art, technology and design meet (pp. 197-201). Boras, Sweden: The Swedish School of Textiles, University of Boras. Bruner, G. C. (1990). Music, mood, and marketing. The Journal of Marketing, 54(4), 94-104. Buss, D. M. (1995). Evolutionary psychology: A new paradigm for psychological science. Psychological Inquiry, 6(1), 1-30. Cai, H., & Lin, Y. (2007). An experiment to non-intrusively collect physiological parameters towards driver state detection. In Proceedings of the SAE World Congress [CD ROM]. Washington, DC: SAE International. Calvo, R. A., & D’Mello, S. (2010). Affect detection: An interdisciplinary review of models, methods, and their applications. IEEE Transactions on Affective Computing, 1(1), 18-37. Carneiro, D., Novais, P., Catalão, F., Marques, J., Pimenta, A., & Neves, J. (2013). Dynamically improving collective environments through mood induction procedures. In A. van Berlo, K., Hallenborg, J. M. C., Rodríguez, D. I. Tapia, & P. Novais (Eds. ), Ambient intelligence–Software and applications (pp. 33-40). New York, NY: Springer. Christensen, L. (2001). The effect of food intake on mood. Clinical Nutrition, 20(Suppl. 1), 161-166. Church, K., Hoggan, E., & Oliver, N. (2010). A study of mobile mood awareness and communication through MobiMood. In Proceedings of the 6th Nordic Conference on Human-Computer Interaction: Extending Boundaries (pp. 128-137). New York, NY: ACM. Clark, M. S., & Isen, A. M. (1982). Toward understanding the relationship between feeling states and social behaviour. In A. H. Hastorf & A. M. Isen (Eds. ), Cognitive social psychology (pp. 73-108). New York, NY: Elsevier. Clark, M. S., & Watson, D. (1988). Mood and the mundane: Relations between daily life events and self-reported mood. Journal of Personality and Social Psychology, 54(2), 296-308. Cohn, J. F., & De la Torre, F. (2014). Automated face analysis for affective computing. In R. A. Calvo, S. D’Mello, J. Gratch, & A. Kappas (Eds. ), The Oxford handbook of affective computing (pp. 131-150). Oxford, UK: Oxford University Press. Cummins, R. A. (2010). Subjective wellbeing, homeostatically protected mood. Journal of Happiness Studies, 11(1), 1-17. Cunningham, M. R. (1988). What do you do when you’re happy or blue? Mood, expectancies, and behavioral interest. Motivation and Emotion, 12(4), 309-331. Davidson, R. J. (1994). On emotion, mood, and related affective constructs. In P. Ekman & R. J. Davidson (Eds. ), The nature of emotion, fundamental questions (pp. 51-55). Oxford, UK: Oxford University Press. Davis, F., Roseway, A., Carroll, E., & Czerwinski, M. (2013). Actuating mood: Design of the textile mirror. In Proceedings of the 7th International Conference on Tangible, Embedded, and Embodied Interaction (pp. 99-106). New York, NY: ACM. Desmet, P. M. A. (2002). Designing emotions (Unpublished doctoral dissertation). Delft, The Netherlands: Delft University of Technology. Desmet, P. M. A., & Pohlmeyer, A. E. (2013). Positive design: An introduction to design for subjective well-being. International Journal of Design, 7(3), 5-19. Desmet, P. M. A., Vastenburg, M. H., Van Bel, D., & Romero Herrera, N. (2012). Pick-A-Mood: Development and application of a pictorial mood-reporting instrument. In J. Brassett, P. Hekkert, G. Ludden, M. Malpass, & J. McDonnell (Eds. ), Proceedings of the 8th International Conference on Design and Emotion [CD ROM]. London, UK: Central Saint Martin College of Art & Design. Diener, E., Fujita, F., & Sandvik, E. (1994). What subjective well-being researchers can tell emotion researchers about affect. In Proceedings of the 8th Conference of the International Society for Research on Emotion (pp. 30-35). Storrs, CT: ISRE Publications. Dijkstra, K., Pieterse, M. E., & Pruyn, A. T. H. (2008). Individual differences in reactions towards color in simulated healthcare environments: The role of stimulus screening ability. Journal of Environmental Psychology, 28(3), 268-277. Djamasbi, S., & Strong, D. M. (2008). The effect of positive mood on intention to use computerized decision aids. Information & Management, 45(1), 43-51. Djamasbi, S., Strong, D., & Dishaw, M. (2010). Affect and acceptance: Examining the effects of positive mood on technology acceptance model. Decision Support Systems, 48(2), 383-394. D’Mello, S., & Graesser, A. (2009). Automatic detection of learner’s affect from gross body language. Applied Artificial Intelligence, 23(2), 123-150. Dohrenwend, B. S., & Dohrenwend, B. P. (1981). Stressful life events and their contexts. New York, NY: Prodist. Dohrenwend, B. S., Dohrenwend, B. P., Dodson, M., & Shrout, P. E. (1984). Symptoms, hassles, social supports, and life events: Problems of confounding measures. Journal of Abnormal Psychology, 93(2), 222-230. Dorrestijn, S., & Verbeek, P. P. (2013). Technology, wellbeing, and freedom: The legacy of utopian design. International Journal of Design, 7(3), 45-56. Ekman, P. (1994). Moods, emotions, and traits. In P. Ekman & R. J. Davidson (Eds. ), The nature of emotion, fundamental questions (pp. 56-58). Oxford, UK: Oxford University press. El Kaliouby, R., Picard, R. W., & Baron-Cohen, S. (2006a). Affective computing and autism. Annals of the New York Academy of Sciences, 1093(1), 228-248. El Kaliouby, R., Teeters, A., & Picard, R. W. (2006b). An exploratory social-emotional prosthetic for autism spectrum disorders. In Proceedings of the International Workshop of Wearable and Implantable Body Sensor Network (pp. 3-4). Los Alamitos, CA: IEEE. Erber, R., Wegner, D. M., & Therriault, N. (1996). On being cool and collected: Mood regulation in anticipation of social interaction. Journal of Personality and Social Psychology, 70(4), 757-766. Fagerberg, P., Ståhl, A., & Höök, K. (2004). eMoto: Emotionally engaging interaction. Personal and Ubiquitous Computing, 8(5), 377-381. Fagerberg, P., Ståhl, A., & Höök, K. (2003). Designing gestures for affective input: An analysis of shape, effort and valence. In M. Ollila & M. Rantzer (Eds. ), Proceedings of the 2nd International Conference on Mobile and Ubiquitous Multimedia (pp. 57-65). Linköping, Sweden: Linköping University Electronic Press. Fedorikhin, A., & Cole, C. A. (2004). Mood effects on attitudes, perceived risk and choice: Moderators and mediators. Journal of Consumer Psychology, 14(1), 2-12. Ferguson, Y. L., & Sheldon, K. M. (2013). Trying to be happier really can work: Two experimental studies. The Journal of Positive Psychology, 8(1), 23-33. Fessl, A., Rivera-Pelayo, V., Pammer, V., & Braun, S. (2012). Mood tracking in virtual meetings. In A. Ravenscroft, S. Lindstaedt, C. D. Kloos, & D. Hernández-Leo (Eds. ), 21st century learning for 21st century skills (pp. 377-382). Berlin, Germany: Springer. Forgas, J. P., & Bower, G. H. (1987). Mood effects on person perception judgements. Journal of Personality and Social Psychology, 53(1), 53-60. Frijda, N. H. (1994). Varieties of affect: Emotions and episodes, moods, and sentiments. In P. Ekman & R. J. Davidson (Eds. ), The nature of emotion, fundamental questions (pp. 59-67). Oxford, UK: Oxford University press. Gilbert, D. (2006). Stumbling on happiness. London, UK: Harper Press. Gordijn, M. C., Beersma, D. G., Bouhuys, A. L., Reinink, E., & Van den Hoofdakker, R. H. (1994). A longitudinal study of diurnal mood variation in depression; Characteristics and significance. Journal of Affective Disorders, 31(4), 261-273. Gorn, G. J., Goldberg, M. E., & Basu, K. (1993). Mood, awareness, and product evaluation. Journal of Consumer Psychology, 2(3), 237-256. Gross, J. J. (1998). The emerging field of emotion regulation: An integrative review. Review of General Psychology, 2(3), 271-299. Gross, J. J. (2011). Handbook of emotion regulation (1st ed.). New York, NY: Guilford Press. Gross, J. J. (2013). Emotion regulation: Taking stock and moving forward. Emotion, 13(3), 359-365. Gross, J. J., & Thompson, R. A. (2007). Emotion regulation: Conceptual foundations. In J. J. Gross (Ed. ), Handbook of emotion regulation (pp. 3-24). New York, NY: Guilford Press. Gross, M. D., & Green K. E. (2012). Architectural robotics, inevitably. Interactions, 19(1), 28-33. Häring, M., Bee, N., & Andre E. (2011). Creation and evaluation of emotion expression with body movement, sound and eye color for humanoid robots. In Proceedings of the 20th IEEE International Symposium on Robot and Human Interactive Communication (pp. 204-209). Los Alamitos, CA: IEEE. Hernandez, J., Paredes, P., Roseway, A., & Czerwinski, M. (2014). Under pressure: Sensing stress of computer users. In Proceedings of the SIGCHI Conference on Human Factors in Computing Systems (pp. 51-60). New York, NY: ACM. Herz, R. S. (2009). Aromatherapy facts and fictions: A scientific analysis of olfactory effects on mood, physiology and behavior. International Journal of Neuroscience, 119(2), 263-290. Hirth, J., Schmitz, N., & Berns, K. (2011). Towards social robots: Designing an emotion-based architecture. International Journal on Social Robotics, 3(3), 273-290. Hunsinger, M., Isbell, L. M., & Clore, G. L. (2012). Sometimes happy people focus on the trees and sad people focus on the forest: Context-dependent effects of mood in impression formation. Personality and Social Psychology Bulletin, 38(2), 220-232. Isen, A. M., & Levin, P. F. (1972). Effect of feeling good on helping: Cookies and kindness. Journal of Personality and Social Psychology, 21(3), 384-349. Isen, A. M., Shalker, T. E., Clark, M., & Karp, L. (1978). Affect, accessibility of material in memory, and behavior: A cognitive loop? Journal of Personality and Social Psychology, 36(1), 1-12. Kahneman, D., Diener, E., & Schwarz, N. (1999). Well-being: Foundations of hedonic psychology. New York, NY: Russell Sage Foundation. Kelley, S. W., & Hoffman, K. D. (1997). An investigation of positive affect, prosocial behaviors and service quality. Journal of Retailing, 73(3), 407-427. Knasko, S. C. (1992). Ambient odor’s effect on creativity, mood, and perceived health. Chemical Senses, 17(1), 27-35. Koole, S. L. (2009). The psychology of emotion regulation: An integrative review. Cognition and Emotion, 23(1), 4-41. Kuijsters, A., Redi, J., de Ruyter, B., & Heynderickx, I. (2012). Improving the mood of elderly with coloured lighting. In R. Wichert, K. Van Laerhoven, & J. Gelissen (Eds. ), Proceesings of the Conference on Communications in Computer and Information Science (pp. 49-56). Berlin, Germany: Springer. Küller, R., Ballal, S., Laike, T., Mikellides, B., & Tonello, G. (2006). The impact of light and colour on psychological mood: A cross-cultural study of indoor work environments. Ergonomics, 49(14), 1496-1507. Kwallek, N. (2005). Color in office environments. Implications, 5(1), 1-6. Kwallek, N., Woodson, H., Lewis, C. M., & Sales, C. (1997). Impact of three interior color schemes on worker mood and performance relative to individual environmental sensitivity. Color Research & Application, 22(2), 121-132. Larsen, R. J. (2000). Toward a science of mood regulation. Psychological Inquiry, 11(3), 129-141. Lazarus, R. S. (1991). Emotion and adaptation. Oxford, UK: Oxford University Press. Lewinsohn, P. M., & Amenson, C. S. (1978). Some relations between pleasant and unpleasant mood-related events and depression. Journal of Abnormal Psychology, 87(6), 644-654. LiKamWa, R., Liu, Y., Lane, N. D., & Zhong, L. (2013, June). MoodScope: Building a mood sensor from smartphone usage patterns. In Proceedings of the 11th Annual International Conference on Mobile systems, Applications, and Services (pp. 389-402). New York, NY: ACM. Lin, Y. (2011). A natural contact sensor paradigm for nonintrusive and real-time sensing of biosignals in human-machine interactions. IEEE Sensors Journal, 11(3), 522-529. Lin, Y. Leng, H. Yang, G & Cai, H (2007). An intelligent noninvasive sensor for driver pulse wave measurement. IEEE Sensors Journal, 7(5), 790-799. Littlewort, G., Whitehill, J., Wu, T., Fasel, I., Frank, M., Movellan, J., & Bartlett, M. (2011). The computer expression recognition toolbox (CERT). In Proceedings of the IEEE International Conference on Automatic Face & Gesture Recognition and Workshops (pp. 298-305). Los Alamitos, CA: IEEE. Lorr, M., & McNair, D. M. (1988). Profile of mood states; Bi-polar form (POMS-BI). San Diego, CA: Educational and Industrial Testing Service. Lorr, M., McNair, M. D., & Fisher, S. (1982). Evidence for bipolar mood states. Journal of Personality Assessment, 46(4), 432-436. Lundquist, P., Kjellberg, A., & Holmberg, K. (2002). Evaluating effects of the classroom environment: Development of an instrument for the measurement of self-reported mood among school children. Journal of Environmental psychology, 22(3), 289-293. MacLean, D., Roseway, A., & Czerwinski, M. (2013). MoodWings: A wearable biofeedback device for real-time stress intervention. In Proceedings of the 6th International Conference on Pervasive Technologies Related to Assistive Environments (No. 66). New York, NY: ACM. Maier, E., Wilken, R., Schneider, H., & Schneider, G. K. (2012). In the mood to buy? Understanding the interplay of mood regulation and congruence in an international context. Marketing Letters, 23(4), 1005-1018. Martin, L. L, & Clore, G. L (2013). Theories of mood and cognition: A user’s guidebook. Hoboken, NJ: Taylor and Francis. Martin, M. (1990). On the induction of mood. Clinical Psychology Review,10(6), 669-697. Matthews, G., Jones, D. M., & Chamberlain, A. G. (1990). Refining the measurement of mood: The UWIST mood adjective checklist. British Journal of Psychology, 81(1), 17-42. McCloughan, C. L. B., Aspinall, P. A., & Webb, R. S. (1999). The impact of lighting on mood. Lighting Research and Technology, 31(3), 81-88. McDuff, D., Karlson, A., Kapoor, A., Roseway, A., & Czerwinski, M. (2012). AffectAura: An intelligent system for emotional memory. In Proceedings of the SIGCHI Conference on Human Factors in Computing Systems (pp. 849-858). New York, NY: ACM. Mennicken, S., Scott, J., Bernheim Brush, A. J., & Roseway, A. (2014). Exploring interactive furniture with EmotoCouch. In Proceedings of the ACM International Joint Conference on Pervasive and Ubiquitous Computing (pp. 307-310). New York, NY: ACM. Miniard, P. W., Bhatla, S., & Sirdeshmukh, D. (1992). Mood as a determinant of postconsumption product evaluations: Mood effects and their dependency on the affective intensity of the consumption experience. Journal of Consumer Psychology, 1(2), 173-195. Morris, W. N. (1989). Mood: The frame of mind. New York, NY: Springer-Verlag. Morris, W. N. (1992). A functional analysis of the role of mood in affective systems. In M. S. Clark (Ed. ), Review of personality and social psychology (Vol. 13, pp. 256-293). Newbury Park, CA: Sage. Morris, W. N. (1999). The mood system. In D. Kahneman & E. Diener (Eds. ), Well-being: The foundations of hedonic psychology (pp. 169-189). New York, NY: Russell Sage Foundation. Morris, W. N. (2000). Some thoughts about mood and its regulation. Psychological Inquiry, 11(3), 200-202. Morris, W. N., & Reilly, N. P. (1987). Toward the self-regulation of mood: Theory and research. Motivation and Emotion, 11(3), 215-249. Mota, S., & Picard, R. W. (2003). Automated posture analysis for detecting learner’s interest level. In Proceedings of the IEEE Computer Society Conference on Computer Vision and Pattern Recognition (pp. 49-49). Los Alamitos, CA: IEEE. Negroponte, N. (1975). Soft architecture machines. Cambridge, MA: MIT Press. Nowlis, V., & Nowlis, H. H. (1956). The description and analysis of mood. Annals of the New York Academy of Science, 65(4), 345-355. O’Connor, Z. (2011). Colour psychology and colour therapy: Caveat emptor. Color Research & Application, 36(3), 229-234. Oosterhuis, K. (2005). A new kind of building. In G. Flachbart & P. Weibel (Eds. ), Disappearing architecture; From real to virtual to quantum (pp. 90-118). Basel, Switzerland: Birkhäuser. Parkinson, B., Totterdell, P., Briner, R. B., & Reynolds. S. (1996). Changing moods: The psychology of mood and mood regulation. London, UK: Longman. Parrott, W. G. (1993). Beyond hedonism: Motives for inhibiting good moods and for maintaining bad moods. In D. M. Wegner & J. W. Pennebaker (Eds. ), Handbook of mental control (pp. 278-305). Englewood Cliffs, NJ: Prentice-Hall. Peeters, F., Berkhof, J., Delespaul, P., Rottenberg, J., & Nicolson, N. A. (2006). Diurnal mood variation in major depressive disorder. Emotion, 6(3), 383-391. Picard, R. W. (2000). Affective computing. Cambridge, MA: MIT Press. Picard, R. W., & Healey, J. (1997). Affective wearables. Personal Technologies, 1(4), 231-240. Picard, R. W., & Scheirer, J. (2001). The galvactivator: A glove that senses and communicates skin conductivity. In Proceedings of the 9th International Conference on Human-Computer Interaction [CD ROM]. Mahwah, NJ: Lawrence Erlbaum. Quartier, K., Christiaans, H., & Van Cleempoel, K. (2009). Retail design: Lighting as an atmospheric tool, creating experiences which influence consumers’ mood and behaviour in commercial spaces. In D. Durling, C. Rust, L. L. Chen, P. Ashton, & K. Friedman (Eds. ), Proceedings of the Conference of Design Research Society: Undisciplined! [CD ROM]. Sheffield, UK: Sheffield Hallam University. Rao, V. (2008). Facebook applications and playful mood: The construction of Facebook as a third place. In Proceedings of the 12th International Conference on Entertainment and Media in the Ubiquitous Era (pp. 8-12). New York, NY: ACM. Rétiveau, A. N., & Milliken, G. (2004). Common and specific effects of fine fragrances on the mood of women. Journal of Sensory Studies, 19(5), 373-394. Rogers, P. J., Edwards, S., Green, M. W., & Jas, P. (1992). Nutritional influences on mood and cognitive performance: The menstrual cycle, caffeine and dieting. Proceedings of the Nutrition Society, 51(3), 343-351. Rottenberg, J. (2005). Mood and emotion in major depression. Current Directions in Psychological Science, 14(3), 167-170. Russell, J. A. (2003). Core affect and the psychological construction of emotion. Psychological Review, 110(1), 145-172. Ryan, S. E. (2014). Garments of paradise: Wearable discourse in the digital age. Cambridge, MA: MIT Press. Salem, M., Kopp, S., Wachsmuth, I., Rohlfing, K., & Joublin, F. (2012). Generation and evaluation of communicative robot gesture. International Journal of Social Robotics, 4(2), 201-217. Salonen, H., Lahtinen, M., Lappalainen, S., Nevala, N., Knibbs, L.D., Morawska, L., & Reijula, K. (2013). Physical characteristics of the indoor environment that affect health and wellbeing in healthcare facilities: A review. Intelligent Buildings International, 5(1), 3-25. Sánchez, J. A., Kirschning, I., Palacio, J. C., & Ostróvskaya, Y. (2005). Towards mood-oriented interfaces for synchronous interaction. In Proceedings of the 2005 Latin American Conference on Human-Computer Interaction (pp. 1-7). New York, NY: ACM. Schauss, A. G. (1979). Tranquilizing effect of color reduces aggressive behavior and potential violence. Journal of Orthomolecular Psychiatry, 8(4), 218-221. Schneider, F., Gur, R. C., Gur, R. E., & Muenz, L. R. (1994). Standardized mood induction with happy and sad facial expressions. Psychiatry Research, 51(1), 19-31. Schwarz, N., & Clore, G. L. (2003). Mood as information: 20 years later. Psychological Inquiry, 14(3-4), 296-303. Schwarz, N., & Strack, F. (1999). Reports of subjective well-being: Judgmental processes and their methodological implications. In D. Kahneman, E. Diener, & N. Schwarz (Eds. ), Well-being: Foundations of hedonic psychology (pp. 61-84). New York, NY: Russell Sage Foundation. Seoane, F., Ferreira, J., Alvarez, L., Buendia, R., Ayllón, D., Llerena, C., & Gil-Pita, R. (2013). Sensorized garments and textrode-enabled measurement: Instrumentation for ambulatory assessment of the autonomic nervous system response in the ATREC Project. Sensors, 13(7), 8997-9015. Seoane, F., Mohino-Herranz, I., Ferreira, J., Alvarez, L., Buendia, R., Ayllón, D., Llerena, C., & Gil-Pita, R. (2014). Wearable biomedical measurement systems for assessment of mental stress of combatants in real time. Sensors, 14(4), 7120-7141. Spies, K., Hesse, F., & Loesch, K. (1997). Store atmosphere, mood and purchasing behavior. International Journal of Research in Marketing, 14(1), 1-17. Spillers, F. (2010). Getting in the mood: The role of mood in product design and interaction. In Proceedings of the 7th International Conference on Design and Emotion [CD ROM]. Chicago, IL: IIT institute of Design. Stead, L., Goulev, P., Evans, C., & Mamdani, E. (2004). The emotional wardrobe. Personal and Ubiquitous Computing, 8(3-4), 282-290. Stylios, G. K., & Yang, D. Y. (2013). The concept of mood changing garments made from luminescent woven fabrics and flexible photovoltaics: MoodWear. Advances in Science and Technology, 80(22), 22-29. Sun, D., Paredes, P., & Canny, J. (2014). MouStress: Detecting stress from mouse motion. In Proceedings of the SIGCHI Conference on Human Factors in Computing Systems (pp. 61-70). New York, NY: ACM. Tellegen, A. (1985). Structures of mood and personality and their relevance to assessing anxiety, with an emphasis on self-report. In A. H. Tuma & J. D. Maser (Eds. ), Anxiety and the anxiety disorders (pp. 681-706). Hillsdale, NJ: Erlbaum. Terzis, V., Moridis, C. N., & Economides, A. A. (2010). Measuring instant emotions during a self-assessment test: The use of FaceReader. In Proceedings of the 7th International Conference on Methods and Techniques in Behavioral Research (pp. 18-28). New York, NY: ACM. Thayer, R. E. (2001). Calm energy: How people regulate mood with food and exercise. Oxford, UK: Oxford University Press. Thayer, R. E., Newman, J. R., & McClain, T. M. (1994). Self-regulation of mood: Strategies for changing a bad mood, raising energy, and reducing tension. Journal of Personality and Social Psychology, 67(5), 910-925. Thrasher, M., Van der Zwaag, M. D., Bianchi-Berthouze, N., & Westerink, J. H. (2011). Mood recognition based on upper body posture and movement features. In J. Luo (Ed. ), Affective computing and intelligent interaction (Vol. 137, pp. 377-386). Berlin, Germany: Springer. Tice, D. M., & Bratslavsky, E. (2000). Giving in to feel good: The place of emotion regulation in the context of general self-control. Psychological Inquiry, 11(3), 149-159. Uğur, S. (2013). Wearing embodied emotions: A practice based design research on wearable technology. Milan, Italy: Springer. Valenza, G., Gentili, C., Lanatà, A., & Scilingo, E. P. (2013). Mood recognition in bipolar patients through the psyche platform: Preliminary evaluations and perspectives. Artificial Intelligence in Medicine, 57(1), 49-58. Veenhoven, R. (2008). Healthy happiness: Effects of happiness on physical health and the consequences for preventive health care. Journal of Happiness Studies, 9(3), 449-469. Venkatesh, V., & Speier, C. (1999). Computer technology training in the workplace: A longitudinal investigation of the effect of mood. Organizational Behavior and Human Decision Processes, 79(1), 1-28. Wada, K., & Shibata, T. (2007). Living with seal robots—Its sociopsychological and physiological influences on the elderly at a care house. IEEE Transactions on Robotics, 23(5), 972-980. Wada, K., Shibata, T., Saito, T., & Tanie, K. (2004). Effects of robot-assisted activity for elderly people and nurses at a day service center. Proceedings of the IEEE, 92(11), 1780-1788. Watson, D. (1988). The vicissitudes of mood measurement: Effects of varying descriptors, time frames, and response formats on measures of positive and negative affect. Journal of Personality and Social Psychology, 55(1), 128-141. Watson, D., & Tellegen, A. (1985). Towards a consensual structure of mood. Psychological Bulletin, 98(2), 219-235. Watson, D., & Clarck, L. A. (1994). The panas-x: Manual for the positive and negative affect schedule – expanded form. Iowa, IA: The University of Iowa. Wensveen, S., Overbeeke, K., & Djajadiningrat, T. (2002). Push me, shove me and I show you how you feel: Recognising mood from emotionally rich interaction. In Proceedings of the 4th Conference on Designing Interactive Systems (pp. 335-340). New York, NY: ACM. Woolner, P. (2010). The design of learning spaces. London, UK: Bloomsbury Publishing. Xu, J., Broekens, J., Hindriks, K., & Neerincx, M. A. (2014). Robot mood is contagious: Effects of robot body language in the imitation game. In Proceedings of the 13th International Conference on Autonomous Agents and Multi-Agent Systems (pp. 973-980). New York, NY: ACM. Yildirim, K., Lutfi Hidayetoglu, M., & Capanoglu, A. (2011). Effects of interior colors on mood and preference: Comparisons of two living rooms. Perceptual and Motor Skills, 112(2), 509-24. Zecca, M., Mizoguchi, Y., Endo, K., Iida, F., Kawabata, Y., Endo, N., Itoh, K., & Takanishi, A. (2009). Whole body emotion expressions for kobian humanoid robot—preliminary experiments with different emotional patterns. In Proceedings of the 18th IEEE International Symposium on Robot and Human Interactive Communication (pp. 381-386). Los Alamitos, CA: IEEE. Zeng, Z., Pantic, M., Roisman, G. I., & Huang, T. S. (2009). A survey of affect recognition methods: Audio, visual, and spontaneous expressions. IEEE Transactions on Pattern Analysis and Machine Intelligence, 31(1), 39-58. Zhang, M., & Jansen, B. J. (2009). Influences of mood on information seeking behavior. In Proceedings of the SIGCHI Conference on Human Factors in Computing Systems (Extended Abstracts, pp. 3395-3400). New York, NY: ACM. The overview in Part 1 of this paper was created by reviewing papers published the last ten years in nineteen journals and proceedings of twenty conferences (see below). From these sources, papers were reviewed with the word mood or emotion in the title and/or abstract. In addition, relevant references in these papers were collected and reviewed. Because the words emotion and mood are often used interchangeably, sometimes authors report focusing on moods while actually focusing on emotions, and vice versa. For this reason, the review comprises those initiatives that fit with the mood definition provided in the introduction, independent of what words the cited authors have used. Manuscripts that contributed to the topic of mood in relation to design or technology were selected, which resulted in an overview of more than 150 relevant manuscripts. ACM Conference on Human Factors in Computing Systems; ACM International Joint Conference on Pervasive and Ubiquitous Computing; CHI; Conference on Designing Interactive Systems; DPPI; Design Research Society Conference; IASDR; IEEE Computer Society Conference on Computer Vision and Pattern Recognition; IEEE International Conference on Automatic Face & Gesture Recognition; IEEE International Symposium on Robot and Human Interactive Communication; International Conference on Autonomous Agents and Multi-Agent Systems; International Conference on Design & Emotion; International Conference on Entertainment and Media in the Ubiquitous Era; International Conference on Mobile and Ubiquitous Multimedia; International Conference on Mobile systems, Applications, and Services; International Conference on Pervasive Technologies Related to Assistive Environments; International Conference on Tangible, Embedded and Embodied Interaction; International Workshop on Wearable and Implantable Body Sensor Network; Latin American Conference on Human-Computer Interaction; Nordic Conference on Human-Computer Interaction; SAE World Congress; SIGCHI Conference on Human Factors in Computing Systems. Advances in Science and Technology; Affective computing and intelligent interaction; Applied Artificial Intelligence; Applied Ergonomics; Design Issues; Design Studies; IEEE Transactions on Pattern Analysis and Machine Intelligence; IEEE Transactions on Robotics; Intelligent Buildings International; Interacting with Computers; Interactions; International Journal of Design; International Journal of Human-Computer Studies; International Journal on Social Robotics; Journal of Design Research; Personal and Ubiquitous Computing; Personal Technologies; Sensors; The Design Journal.